Easy peasy. Start with cheese. You can use cheddar, parmesan, monterey jack, whatever you’d like. Otherwise, if you’re doing just plain cheese, you just need to slice it. 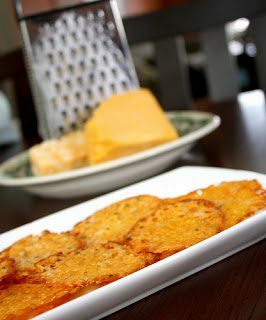 If you’re planning on mixing in seasonings or, grate your cheese. Or get pre-shredded cheese. Either is fine. Preheat your oven to 350 degrees Fahrenheit and put some parchment paper on a cookie sheet. It must be parchment. Foil won’t work (trust me, I’ve tried), nor will “cooking spray” or any other method – parchment only. Now, if you’re using shredded cheese + seasonings, toss it all together in a bowl. Cheddar/Jack and Ranch dressing mix is amazing. “Mexican blend” is great with some chili powder and garlic. Parmesan and basil is always nice. Just don’t add salt. Cheese is already salty on its own. For shredded cheese, put little lumps of it all over the parchment-lined cookie sheet, spaced out because they WILL “grow” and spread more than you think they will. And when I say “little” lumps, I mean little… about a teaspoon of cheese each. If you’re using plain cheese, slice it thinly (not paper-thin, but like “sandwich slices” thin) and break or cut it into little squares. About an inch square is good. Again, they will spread out, so place these on the parchment-lined cookie sheet, spaced out like cookies. Now put it on a rack centered in the middle of your oven, and bake for 5-7 minutes. Then peek. If the edges are starting to brown, you could try taking it out. If you’re not sure, leave it in for another minute or two. When you remove them from the oven, you’ll need to let them cool. If you have the sort of countertop that feels cold, you can just lift the whole piece of parchment off the cookie sheet, and set it on your counter for a few minutes. Or if you don’t, you can use a pancake-flipper thing (what are they really called? not spatulas; those are different) to pick them up and put them on a cool plate. After a few minutes, they’ll be crisp! And you have a great snack.